Thousand Mile Trial, by Elizabeth Bennett. 376 pages, 450 illustrations, full colour throughout. 8.5 inches x 11 inches. ISBN 0-9537930-0-1. Published by Elizabeth Bennett, Heathfield, E. Sussex, U. K. Price: £35. I have reviewed so many hundreds of motoring books along the years, that I have become accustomed to them in all sizes, shapes, good, indifferent and a few less good. 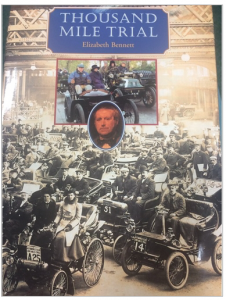 But nothing has made the impact, for a very long time, as did Mrs Elizabeth Bennett's masterful work on the 1900 One Thousand Mile Trial, perhaps the most important landmark in the history of the British motor movement.